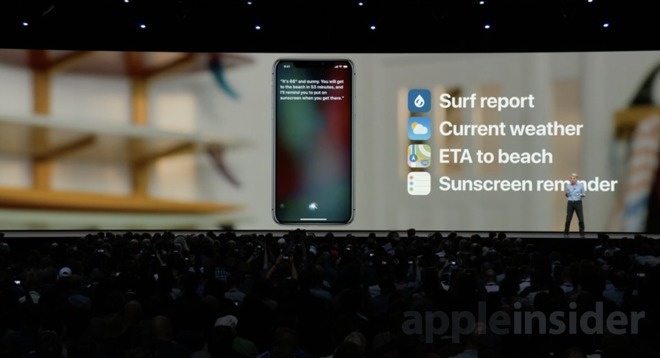 Developers can now request access to an early version of Apple's Shortcuts app, which lets iOS 12 owners create custom automations triggered through Siri. Access is restricted to developers only, and people accepted for testing must install the app through TestFlight. In release notes, Apple cautions that "limited actions" are currently available, and won't sync via iCloud. In fact the Shortcuts beta has several known issues, others being that some actions won't appear when running custom shortcuts in Siri, and it can't yet open apps when a device is locked. Apple also notes that shortcuts provided to the INVoiceShortcutCenter suggested shortcuts API are not available when viewing an app's actions in Shortcuts. Apple issued a second public beta of iOS 12 earlier on Thursday. The promise of Shortcuts is the expansion of automation beyond HomeKit to every aspect of iOS, so long as developers enable hooks in their own titles. During Apple's WWDC keynote in June, the company used the example of a custom "I'm heading home" phrase for Siri, which automatically texted a contact with a preset message, adjusted a HomeKit thermostat, turned on a fan, presented estimated travel time, and started playing NPR. In iOS 11, this would require several separate commands. The concept is similar to the skills and routines baked into Amazon's Alexa. To develop its own equivalent Apple bought out Workflow, which allows automations akin to Shortcuts but more limited.